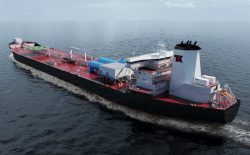 Teekay Offshore Partners L.P. (Teekay Offshore), a global marine services company, has secured a long-term debt facility that will enable the company to finance four Liquefied Natural Gas (LNG)-fueled Suezmax DP2 shuttle tanker newbuildings. Upon delivery in 2019 and 2020, two of the vessels will commence operations under the Partnership’s Master Agreement with Equinor, while the remaining two vessels will join the Partnership’s contract of affreightment (CoA) shuttle tanker portfolio in the North Sea. The new $414 million facility is funded and guaranteed by both Canadian and Norwegian export credit agencies, and commercial banks and bears interest at LIBOR + 225 basis points with a tenor for up to 12 years from the delivery date of each vessel and a blended profile of 18 years. Teekay Offshore Partners L.P. is a leading international midstream services provider to the offshore oil production industry, primarily focused on the ownership and operation of critical infrastructure assets in offshore oil regions of the North Sea, Brazil and the East Coast of Canada.